Bathinda is all set to shed the image of being a backward land and don the cap of having four universities — including Central University of Punjab (CUP) and three private universities. The distinction, however, would come with a rider. Eyeing prime property worth crores to meet with its financial obligations, the Punjab government plans to sell off the Municipal Corporation Bathinda (MCB) building. The house of an NRI was ransacked in Silver City Colony and valuables worth Rs 2.9 lakh were stolen. In yet another case of a pocketing money in the name of sending an individual abroad, the Kotwali police has booked five residents of Jalandhar. According to the available information, they have been accused of duping Guravtar Singh, a resident of Malout, in the name of sending him abroad. A case has been registered at the Nehianwali police station against eight persons for opening fire on Avtar Singh, a resident of Harraipur. 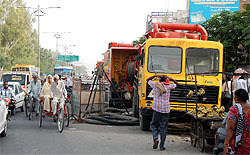 Traffic chaos increased manifolds on the road outside the bus stand after machines, engaged in the work of cleaning sewers, were parked by the roadside. The Bill for setting up Adesh University at Bathinda and Chandigarh University at Kharar would be presented before the cabinet on June 29. With the Bill being passed, Adesh institute would be the only varsity in Punjab to have a medical college under its wing, enabling it to conduct admissions and no longer be under Baba Farid University of Health Sciences. Bathinda district already has the CUP, private university Guru Kashi University at Talwandi Sabo and the upcoming Baru Sahib University at Talwandi Sabo. With Adesh getting nod, next to follow suit would be an institute near Deon that too is preparing to apply for the private varsity status and is hopeful of getting an approval. While the educationists have condemned the idea of setting up so many private universities, the university managements reason that these universities will only improve the standard of education in the area. “As per the Punjab government act, the private universities would not be affiliating universities. Unlike state universities, these universities will not have affiliated colleges and instead would run courses on their own campuses,” said one of the private university owners who did not want be named. Not taking chances till the cabinet approves setting up of varsities and issues a due notification, none of the owners wish to talk about their ventures. Stating an example of students under Punjab Technical University, one of the owners reasoned that around 2.5 lakh students study as regular candidates and PTU has almost the same number of students studying through distance education. “This translates into at least 60 to 70 lakh answer sheets being checked every six months, which includes students who appear for compartment exams. It is impossible for PTU to assess such large number of students and it is here where private varsities will have an important role to play,” reasoned another owner. The technical colleges face a typical problem of students who are unemployable. Private sector is hopeful of addressing these issues and impart skills to the technical certificate, diploma and degree holders, making them more employable. Management concerned should have 10 or more years of experience in running colleges. 35 acres of land is required. Endowment funds of Rs 5 crore to be deposited with the state government. The Punjab government has laid stringent guidelines for setting up of varsities. Unlike Chhattisgarh, where government gave nod to varsities located in two rooms under state university act, the Punjab’s guidelines are strict. Every private university would have a Bill named after it and the Department of Higher Education, Government of Punjab, would govern them. Eyeing prime property worth crores to meet with its financial obligations, the Punjab government plans to sell off the Municipal Corporation Bathinda (MCB) building on Mal Godam road and re-locate the office near The District Administrative Complex. Situated in the business hub near railway station, post office and city’s main market, the land would be up for grabs after the corporation moves agenda in house seeking shifting of the office. Earlier, the building was situated opposite the Amartex shop and shared its wall with the tehsil office where PUDA recently auctioned 18 commercial sites. 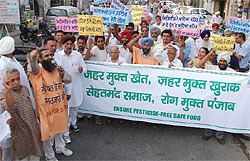 In the late 1990s, the site was sold off to PUDA and the office was shifted to its present location, which had office of State Bank of Patiala (SBOP) and Food Corporation of India (FCI). Corporation officials state the shortage of space for parking as the prime reason behind the shifting. This 4,000 sq yards of land would go under hammer as soon as the corporation moves a proposal in the house to shift the building and transfer the land in the name of PUDA, which will further put it on sale. Issue even figured at the closed door pre-agenda meeting of SAD leaders held at the corporation office today. Sources said the issue of shifting the office would be brought up during the house meeting to be convened in next two weeks. The shifting would, however, draw ire from the people. The present building is situated in the heart of the city and those living in the trans-railway line find it easier to commute to the office. “Shifting would mean depriving people of these areas of the basic amenities. Already the area is under-developed and shifting the MC office would only add to their woes,” said Congress municipal councilor, Jagrup Singh Gill. In 2009, the corporation had tried to sell off its Blue Fox property for garnering funds. The move, however, drew ire and city residents filed a public interest litigation (PIL) stating that corporation had no right to sell public property secretly. Following the PIL, the land mutation was transferred back to the name of the corporation and later the corporation took a bank loan against the same property. In order to rule out such a scenario, the agenda would be put before the house for consideration. In his complaint at the Canal Colony police station, complainant Gurdeep Singh stated that some unknown person ransacked his house in the intervening night of June 25 and June 26. He also stated that the burglar decamped with Rs 6,000 cash, USA and Australian dollars and Thailand currency. A gold bangle, two rings and a pair of ear rings were also found to be missing from the house, he added. Gurdeep Singh’s neighbour, Lakhvir Singh, shared his fate as his house was also borken into. In his complaint to the police, Lakhvir stated that Rs 1,000 cash, two bowls of silver and an ATM card had been stolen. In yet another case of a pocketing money in the name of sending an individual abroad, the Kotwali police has booked five residents of Jalandhar. According to the available information, they have been accused of duping Guravtar Singh, a resident of Malout, in the name of sending him abroad. 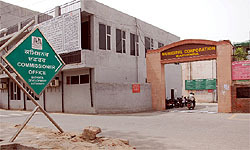 A case was registered after the economic offences wing conducted an inquiry into the matter. Two years ago, Guravtar Singh, a resident of Baba Deep Singh Nagar in Malout, gave money, totalling upto Rs 14.2 lakh, to five residents of Jalandhar, for going abroad. 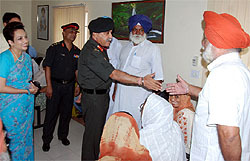 The monetary transaction took place in Bathinda. The accused, however, neither sent him abroad nor returned his money. The five accused have been identified as Yudhvir Minhas, a resident of Bhagouli area in Jalandhar, Daljit Kaur and Lovely Kumar, both residents of Jalandhar cantt, Ashwani Kumar, a resident of village Sansarpur in Jalandhar and Nindi Travel Agent, located near the city’s bus stand. In his complaint to the police, Avtar Singh stated that Sukhwinder Singh, Darshan Singh, Avtar Singh, Balkar Singh, Gulzar Singh, all residents of village Harraipur, and Randhir Singh, Gurdeep Singh and Sikandar Singh from Sivian area beat him up and opened fire. Although a case has been booked, the police is yet to arrest any of the eight accused. Commuters confessed that they had a harrowing time passing through the stretch of road in front of the bus stand. Other vehicles parked by the roadside added to the travails of the commuters. Despite traffic police’s claims of increasing the check on vehicles parked haphazardly on the city roads, there seems to be no respite from the chaos. Commuters said to prevent getting caught in the traffic bottleneck, they avoided taking the road infront of the bus stand. Instead, they took alternate routes to reach their destinations. “I waited for more than half an hour to cross the traffic light outside the bus stand but the traffic was irritatingly slow,” said Joginder, a resident of Power House Road. Bathinda city traffic police in-charge Ranjeet Singh said the problem was witnessed on the stretch of road between the bus stand and Fauji Chowk. He said they were facing problem ever since the vehicles, cleaning the sewerage were parked by the roadside. He said to get rid of the traffic problem, the traffic police had sent a proposal to the Municipal Corporation to construct a slip road by erecting iron pipes. This will help buses, coming from the Rajindra College side, enter the bus stand without stopping at the traffic light. He added that similar plans were made for the Tinkoni Chowk, Hanuman Chowk and Fauji Chowk bus stops.